Danny Cheng: "One Hyde Park looks just like my halls of residence at Aston University, which called Lakeside; so, can I rent and live there for £75 per week?" Mail: "The £140m flat: World-record price earns mystery buyer boasts a penthouse view over Central London, a private wine-tasting facility and an underground passage to a Heston Blumenthal restaurant. There is also a tunnel to the neighbouring Mandarin Oriental Hotel – where TV chef Blumenthal will soon open his first London restaurant – to allow residents access to 24-hour room service, while the performance car-maker McLaren is opening a showroom on the ground floor. And should the residents feel the need to venture outside, the local ‘corner shops’ include Harrods and Harvey Nichols. 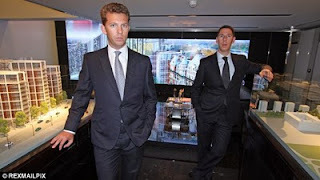 But even estate agents could not contain their amazement yesterday as a London property was on the verge of being sold for £140million – making it the most expensive flat in the world. The previous most expensive flat was valued at £115million in a rival Central London development at St James’s Square in 2008. Trevor Abrahamson of estate agent Glentree Estates said of the latest sale: ‘This is a huge price. In the last six months we have sold more trophy properties than we have in the last two years. While the identity of the new owner is shrouded in secrecy, the usual super-rich suspects of Russian oligarchs and Arab billionaires are in the frame. In all a quarter of buyers in the block are Middle Eastern, while one third are European. Around 65 per cent of all the properties in the block – due to open later this year – have been sold. The average cost is, comparatively speaking, a mere trifle, at £20million. The £140million price tag is seen as a sign that the top end of the property market has been untouched by the recession as the world’s financial elite continue to flock to London, taking advantage of the weakness of the pound. The property, designed by architect Lord (Richard) Rogers’s firm, Rogers Stirk Harbour and Partners, is being marketed by developer brothers Christian and Nick Candy. They bought the site, formerly occupied by a grim 1950s office block, for £150million in 2004. Candy & Candy refused to comment on the sale of the flat, citing client confidentiality. The Candys hit the headlines recently over their efforts to redevelop Chelsea Barracks after the Prince of Wales complained to their Qatari backers about the design.